Pineapple is a tropical fruit whose scientific name is “Ananas comosus”. The tasty, fleshy, and juicy fruit is consumed with joy all across the world. Costa Rica is currently the largest producer of pineapples in the world and India lies in the 6th position. In India, one can find pineapple cultivation all over the North East states, West Bengal, Maharashtra, Kerala, Karnataka, Bihar, & Goa. It is a famous roadside snack. The freshly extracted pineapple juice is important in lowering the level of cholesterol, strengthening the digestive system, preventing cold, & preventing anemia. Pineapple is used in various cuisines in preparing various yummy dishes from fruit salad to yoghurt, jam, sweets & ice cream to pizza toppings. One of the much popular use of pineapple is its inclusion in cakes. The slightly sweet and bleakly tangy taste of pineapple makes the cake tastier. 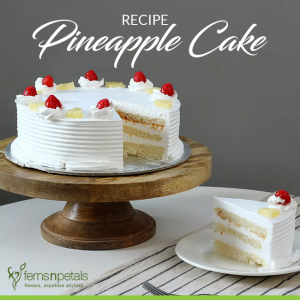 Read the recipe of pineapple cake and surprise your friends & family on special occasions. How To Make The Pineapple Cake? Firstly, take a mixing bowl and break the eggs and whisk, one at a time. Now, pour the suggested amount of sugar, vanilla essence, & baking powder. Beat them well until the mixture becomes light & foamy. Now, very carefully, fold in 1 tablespoon of flour in this mix. Mix the flour with downward, upward and outward strokes. Now add the rest of the flour in the same way. Take the cake tins and grease them first with butter or refined oil and then sprinkle some flour on it. Now, divide the cake batter into two equal portions and fill each of the cake tins. Preheat the oven meanwhile when you are preparing the cake batter at 400 F/204 degrees Celsius temperature. Place the cake tins carefully in this pre-heated oven for 20 minutes. Check the cake after 20 minutes with a sharp knife. If the knife comes out clean, then, your cake is done. Once your cake is done, bring it out from the oven and place it on a cooling rack. Allow the cake to cool completely before proceeding to the garnishing stage. Take one pineapple cake and sprinkle half the pineapple syrup on it. Then layer it with whipped cream and chopped pineapple and take the other pineapple cake to cover it. Now, sprinkle pineapple syrup on it and use the whipped cream to cover the whole cake. Use some chopped pineapples to decorate the top of the cake. You may further use some chocolate chips or almond slices to decorate the sides of the cake. Some strawberries or cherries would also look great as a garnish on the cake. Amazing Gifts for First Wedding Anniversary- Surprise Your Better Half!